Intuitive interface, lightweight design, awesome tube-driven sound During the 1960s, a wonderful transistor organ from VOX appeared on the s..
During the 1960s, a wonderful transistor organ from VOX appeared on the scene and became a firm favourite with keys players the world over, as they were now presented with a practical keyboard that was usable on any live stage! Cut to 2017, and VOX have revisited this original concept and carried it into the modern age, re-releasing the awesome VOX Continental, seen here in the 73-key version! Pick up a Vox Continental Keyboard at a PMT Blowout Price, while limited stocks last! To find out the availability at your local PMT Store, call our sales team, or pop in for a Demo. 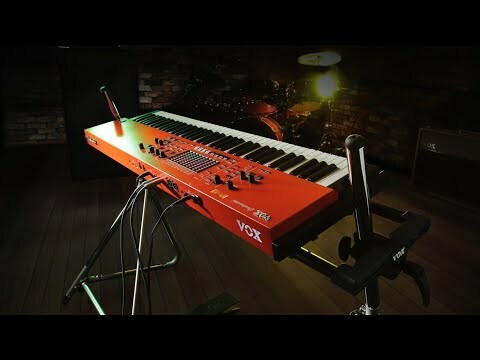 Featuring a high-quality sound engine centred on organ, electric piano, and acoustic piano, as well as a wealth of stage-ready sounds, the VOX Continental 73 would make a welcome addition to any stage setup. In addition, there's a powerful effects section and 9-band EQ to further enhance the Continental's sound, and the whole thing is even powered by an analog valve drive using NuTube technology! When versatility is the key, the Continental is the one for you. The VOX Continental 73 grants you immediate access to all functions via the front panel, making it the perfect instrument for keyboardists in today's demanding live music arena. The panel is easy-to-use and features an independent layout for each of the four voices (Organ, E. Piano, Piano, and Key/Layer). Additionally, the built-in touch sensors allow control of a variety of parameters for each voice, and the Scene Memories function grants you fast recall of programs and effects settings. With 150-carefully selected built-in programs, a high-quality PCM sound engine, and its sophisticated vintage sound modelling enging, the VOX Continental 73 is an absolute work horse of a keyboard. Each of the Continental 73's three main functions (Organ, Electric Piano, and Piano) each contain three different sound engines, each one replicating the voices of high-quality, and highly sought-after keys instruments. On the Organ you get to choose between the VOX transister organ sound engine (a perfect replica of the original 1960s VOX Continental); the Compact (another compact transistor organ from the same era as the original Continental); and the CX-3 Tonewheel organ, which faithfully models KORG's classic combo organ. Each of these voices gives you access to the revolutionary touch drawbars, allowing you to freely control the Continental 73's harmonics and tone. And if that wasn't enough, you can add vibrato/chorus and the rotary speaker simulation to each voice at the flick of a switch. As with the Organ, the Continental 73's E. Piano setting gives you three different sound enginers to work with: with Tine you are presented with the kind of sound achieved by striking a metal bar; Reed recreates the sound of a vibrating reed being struck, as was the case in vintage electric piano; and finally the FM setting gives you that iconic 80s electric piano sound! Combine any of these voices with the realistically simulated amp and cab modelling, as well as carefully sampled overtones, and be blown away by the possibilities at your fingertips. The three, rich, luxurious voice settings of the acoustic piano bring a variety of delicate and powerful tones to your arsenal. The Grand setting offers peerless resonance, whilst Upright proves the uniquely sophisticated depth of an upright piano, and finally the E. Grand replicates an electric grand piano which would be ideal for pop music. Additionally, Grand and Upright feature a range of lavish, non-looped stereo samples for every key! This voice setting offers a wide rang eof practical sounds that will be immediately usefull in any band or ensemble setting. The six categories to choose from are Keys, Brass, Strings, Lead, Synth, and "Other", each one perfectly working towards covering the keys part in any musical style. Whilst the EQ section is engaged, the touchbars work as a nine-band graphic master EQ! These touchbars respond to the lightest touch of your fingertips, and they provide the graphical operability of drawbars, together with the versatile functionality expected from the technology of today. These controls allow for intuitive movement, granting you the ability to adjust your settings on the fly without having to shift your concentration from your performance. KORG's NuTube technology has been untilised to its fullest with the VOX Continental 73. The NuTube adds the stunning presence and warmth of a traditional vacuum tube, adding plenty of colour to your sound, a smooth distortion, and a dense and fat sound that always seems to be missing when modelling. With a simple turn of the control know, you can adjust the way in which your playing dynamics affect changes to the overall volume and sound. With a wide range of expressions from pianissimo to fortissimo, the VOX Continental 73 provides a richly emotional performance, whatever the setting. Whether you've discovered that perfect sound setup and don't want to get rid of it, or whether you want to use one of the frequently-used variations, these can be registered as one of 16 scenes (4 scenes x 4 banks) and recalled instantly whilst you perform. There's also the option of you using a USB drive, with the ability to save and load up to 100 sets of 16 scenes. Oh wait... it does! The finishing touch on the VOX Continental 73 is the inclusion of the V861 expression pedal, and dedicated keyboard stand. If you have any more queries regarding this wonderful keyboard, please contact our online sales team directly, or alternativelly call into your local PMT Store and speak with one of our resident product experts!